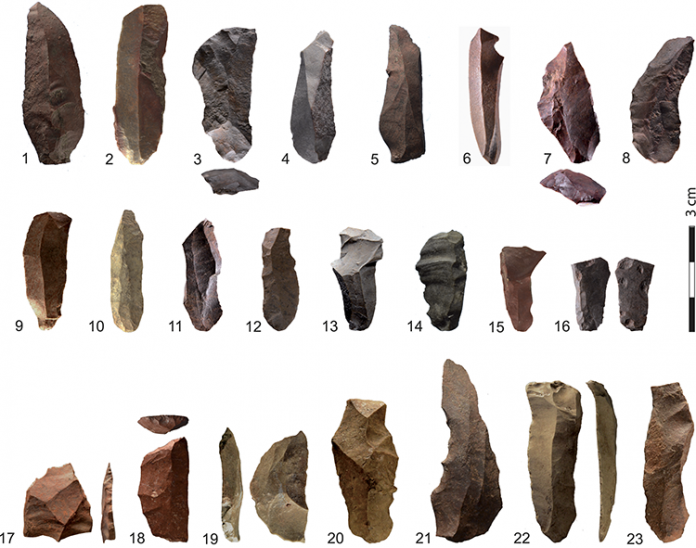 During the recently research about producing tools and weapons in the Upper Paleolithic and Middle stone age scientist concluded that prehistoric humans around 65.000 years before present use fire to heat stone in order to easily obtain blades. Recently study published in the journal “PLOS ONE” by team archeologists and anthropologists confirm this theory. This technique of heating stones which Paleolithic and Mesolithic humans used, archeologists called Howiesons Poort (or shortly HP). Howiesons Poort period latest around 5.000 years and it’s named after a small rock shelter in South Africa. One of the first scientific paper about this site has been publish in 1927 by Hewitt John and Reverend A. P. Stapleton under the name “Stone implements from a Howieson’s Poort, near Grahamstown”. However, the exact role of this important development of tools and weapons in the Middle Stone Age was not previously clear. According to professor Christopher Henshilwood, Mesolithic humans from Howiesons Poort site perhaps firstly produced bow and arrow compare to other prehistoric groups of people. The heat treatment enabled prehistoric humans to produce tougher and harder stone tools. Tools from Mesolithic period archeologist often called microliths because compared to paleolithic tools, blades of microliths are much smaller. Scientist led by Anne Delagnes, Henshilwood, van Niekerk and the research team, from South Africa and Germany also concluded that humans on the southern Cape of South Africa (Klipdrift Shelter) using same heating technique. The results of this significant study scientiest published in journal “PLOS ONE” under the name “Early Evidence for the Extensive Heat Treatment of Silcrete in the Howiesons Poort at Klipdrift Shelter (Layer PBD, 65 ka), South Africa”. “Based on the development of a non-destructive method using geological heated and unheated comparative reference samples, we have shown that more than 90 per cent of the silcrete used for the production of blades has been intentionally heated,” says Henshilwood. The authors in the paper suggest that silcrete heat treatment at the in southern Cape of South Africa (Klipdrift Shelter) may provide the first direct evidence of the intentional and extensive use of fire applied to a whole lithic (stone) chain of production. One interesting scientific article about Klipdrift Shelter published in 2014. by a group of authors in Journal of Archaeological Science under the name “Klipdrift Shelter, southern Cape, South Africa: preliminary report on the Howiesons Poort layers”. Despite all those study’s still not cleared how this technique of heating stones applied in practice by prehistoric humans.